Archives : QUIET EXPIRY FOR OCTOBER SERIES - 26/10/2012. QUIET EXPIRY FOR OCTOBER SERIES – 26/10/2012. It was one of the least volatile expiries seen in recent times. The consolidation continued almost through the better part of the October series. Nifty still continues to trade in a narrow range of 100 points between 5730 - 5630 and Sensex in a range of 300 points between 18850-18550. The market now looks set for a breakout after a long pause. A bullish breakout will take the market towards the intermittent top and a bearish breakout will take the market lower towards the bullish gap between Sensex 18284-18062 and Nifty 5526-5447. Sensex opened the week at 18655, made a high of 18812, low of 18558 and closed the week at 18625. Thus it registered a small weekly loss of 57 points. At the same time the Nifty opened the week at 5667, made a high of 5721, low of 5641 and closed the week at 5664. Thus the Nifty went down by 20 points on a weekly basis. Both the indices have formed a small black body candle on the daily charts. Last three weeks have seen formation of small body candles within the small range of 100 points for the Nifty and 300 points for the Sensex. On the weekly chart Nifty has formed a Doji, whereas the Sensex has formed a Spinning Top with a small black body which is also a neutral formation. This is second consecutive neutral formation on the weekly charts and hence a lot now depends on the next weeks candle formation. Nifty has formed an Inside Day on the weekly charts, which tells us how low the volatility has been for the past week. The current consolidation is a result of profit booking and also it is a result of the price reaching the target of the primary basic pattern which was at Sensex 19116 and Nifty 5788. The primary basic pattern was due to the fall from Sensex 17432 to 15748 and Nifty 5279 to 4770. Currently Sensex is moving in a small range of 300 points and Nifty 100 points. A close below Sensex 18535 and Nifty 5633 will once again resume the retracement of the immediate rise of Sensex from 17250 to 19137 and 5215 to 5815 for the Nifty. The Retracement levels for the Sensex are at 18416-18193-17971 and 5586-5515-5444 for the Nifty. A Bullish Rising Gap between Sensex 18062-18284 and Nifty 5447-5526 has acted as a strong support for the market before as the Sensex had bounced back from a low 18291 and Nifty 5534. This gap holds more significance because the 50% Retracement of the immediate rise from 17250 to 19137 for the Sensex and 5215 to 5815 for the Nifty (which is at 18193 and 5515) is also within the Gap mentioned above. For the entire week, the market played with the short term average of 20dma (Sensex – 18745 and Nifty – 5696) but finally closed the week below it. But the market continues to be well above its medium term average of 50dma (Sensex – 18244 and Nifty – 5531) and the long term average of 200dma (Sensex – 17393 and Nifty – 5274). Thus the trend in the short term is down, while the medium term and the long term timeframe continue to be bullish. MACD even though positive is under Sell mode. Also ROC is in Sell mode by being below the centerline. RSI has fallen to 52 and indicates a fall in bullish momentum. Stochastic Oscillator is in Sell mode as %K (83) is below %D. ADX continues to be high at 38 indicating that the uptrend is still strong. The Directional Indicators i.e. +DI and –DI continue with their buy signal but are converging now as the fall in +DI is quite substantial. Money Flow is below the centerline to 45, indicating selling. OBV continues to remain sideways. The Bollinger Bands have narrowed which suggests that the volatility has reduced considerably. A period of low volatility will be followed by a period of high volatility and hence a breach of the Bollinger Band will lead to an expansion of the bands and a strong movement in the direction of the breakout. The Nifty O.I. PCR is at 1.11. This is comparatively lower for the start of a fresh series. Also the November series starts on a lighter note. 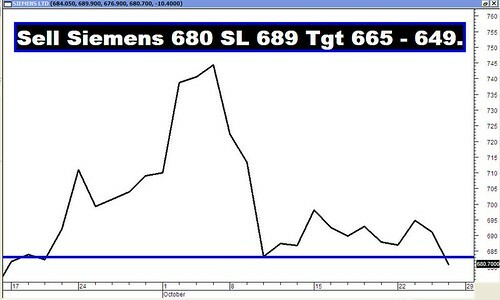 The highest Open interest build up for the November series is seen at 5600 Put and 5900 Call. This suggests that the market expects a trading range with strong support coming in at around 5600 and resistance at around 5900 levels for the November series. Interestingly 5300 Put has seen a very strong build-up. Option writers clearly expect the market to find strong support around Nifty 5300, if the level of 5600 is breached. Trendline Support for the Sensex is at 18483. Trendline Resistance for the Sensex is at 19195. Trendline Support for the Nifty falls at 5597. Trendline Resistance for the Nifty falls at 5833. For the week ahead, Sensex will find Support at 18349-18063-17819 and will find Resistance at 18886-19137-19424. For the week ahead, Nifty will find Support at 5577-5490-5404 and will find Resistance at 5743-5815-5912.